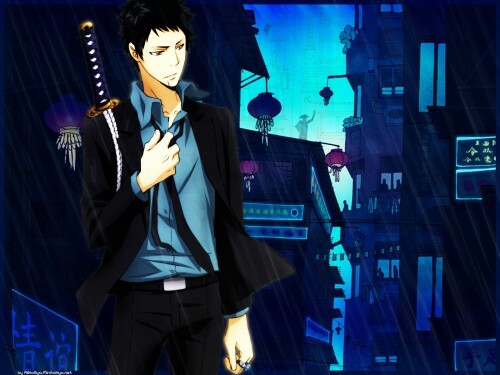 Finally, a Yamamoto Takeshi wallpaper! Well, I didn't do the background. I found it on the web, but as I don't remember exactly where it's from (because I have loads of pictures, and I often forget where I found them :\), I uploaded it somewhere else so that you can use if you want to. And, if anyone knows who did it, let me now please, and I'll edit this description. It was a hell of a job to color it D: I wish the quality was better, 'cause I was losing my temper while I colored it. Anyway, I survived and liked the result. And it was my first attempt to do a "rain" wallpaper. I had to search for tutorials on how to do it, and the drops wouldn't look like drops at all, so.. yeah, I hope next time it turns out better. It took me one day to do it (of course I stopped to eat, to chat and I confess I slept a little during the process xD), and it had about 15 layers. Awesome wall! I love it! I'm a big fan of Takeshi too :) Nice background, matches the scan very well. Thanks for sharing! very nice wall of yamamoto except that his scar is on the left side rather than the right side! That's pretty cool... did you draw the background yourself? Tanks Rikko-san. I like it. Hehe, its so pretty! Love the whole thing and the idea is wonderful. Loved it so much! You did such a great job! reminds me of my boyfriend.. heehee. Great work!